how should I enjoy my tea? We have specially selected this afternoon blend of Assam and Kenyan tea leaves because it's great to drink with or without milk. Just add boiling water and brew for 3-4 minutes, then add milk if you want it. Now sit back and enjoy! Our acai and blueberry fruit tea can be enjoyed hot or cold. For hot tea, fill your mug with boiling water and brew for 2-3 minutes. 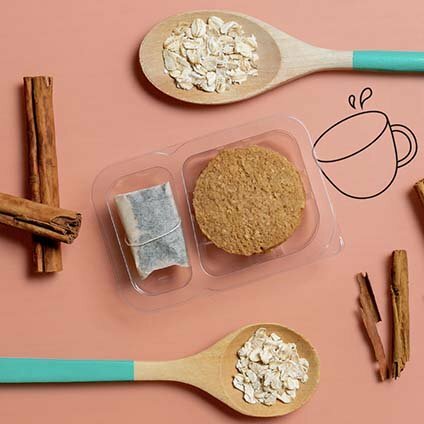 For a more refreshing fruity iced tea, half fill your mug with boiling water and brew for 4-5 minutes before removing the tea bag and topping up with cold water and ice. 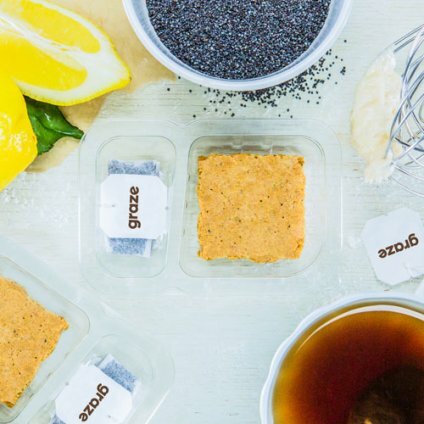 This tea comes with the blueberry acai bite. We've used the finest Chinese green tea leaves and given them a citrus twist with the addition of bergamot. Brew your tea bag in boiling water for 2-3 minutes. 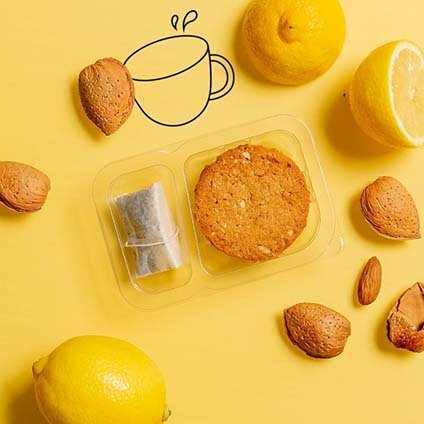 Our afternoon infusion and green tea varieties both contain caffeine. The acai & blueberry is caffeine-free. how do I check the ingredients? Just click on the pictures to see the full list of ingredients in each cake. are these snacks suitable for vegans? 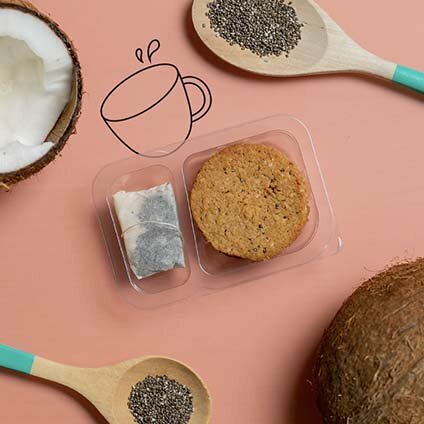 Our banana bread, carrot cake and lemon & poppy slice all contain free range eggs and our chia & coconut cookies contain butter, so these snacks are not suitable for vegans. 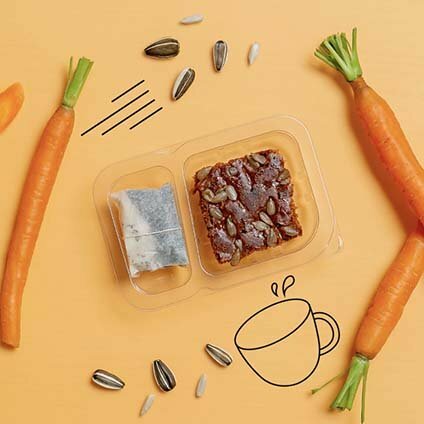 are these snacks suitable for coeliacs? 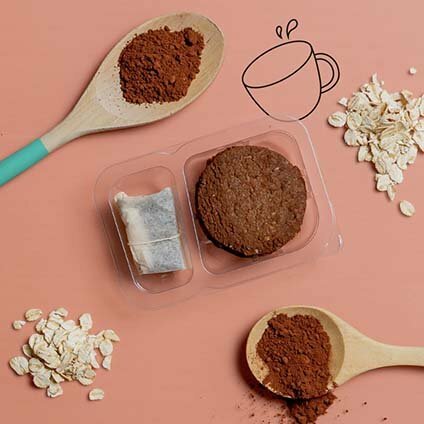 However, all of our snacks are packed in the same place so there is a possibility of cross-contamination between any of the ingredients we use, and therefore graze is not suitable for people with allergies or intolerances. Our snacks may contain traces of gluten, eggs, peanuts, soya, milk, nuts, celery, mustard, fish and sesame. how long will my snacks last? All these snacks are baked fresh in our bakery in the Cotswolds without any additives or preservatives, so they're best enjoyed as quickly as possible. 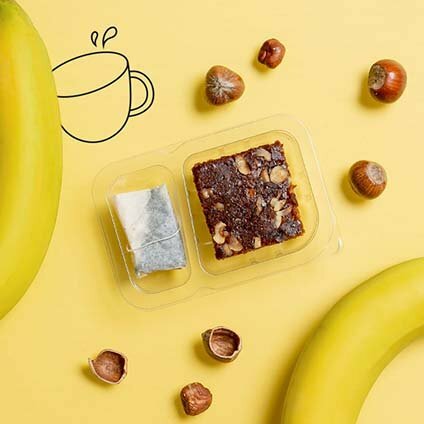 The banana bread, carrot cake and lemon & poppy slice should be enjoyed on the day your box arrives.